I wanted to have a go at making a collarless, open fronted jacket, popularised by Coco Chanel, ubiquitous on any star, and widely seen at golf clubs and other functions for dressy matrons. 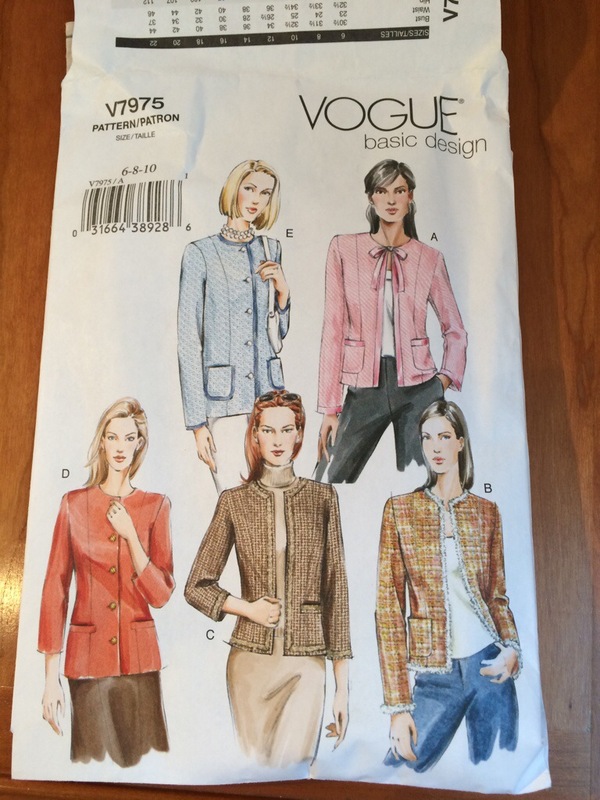 Before tackling the more advanced three-piece sleeve “French” or Chanel-style jacket Vogue 8804, I decided I would try to make a jacket using the simplified Vogue 7975. I hadn’t done any tailoring for about 25 years and was fairly intimidated by the amount of time, and cost of materials, that was apparently required to make the “couture” version. V 7975 is a “Vogue basic design” – not sure what that means other than it can be customised. It features bracelet or full length sleeves; buttons or open front; longer or shorter length; patch or fake welt pockets; and can be finished with or without “purchased” trim. Although the models on the pattern envelope look somewhat dowdy (especially E and D – the buttoned up pair) I thought the younger set (A,B and C) looked quite shapely. 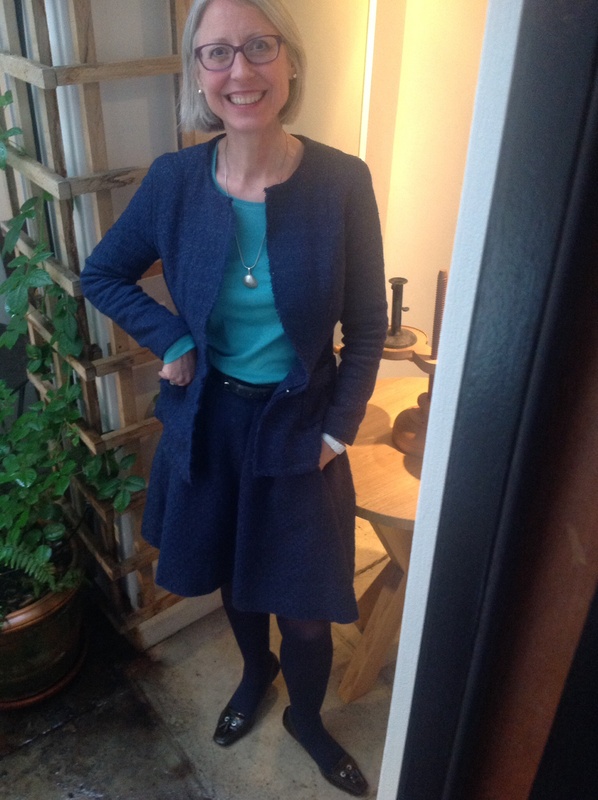 In order to test the pattern I bought an inexpensive tweedy cotton from Simply Fabrics and made up jacket B fairly quickly in my size ie b34, size 12. The main problem with this pattern, and V 8804 if you progress to that, is the huge amount of ease allowed for. I think this is what stops a lot of sewists persevering. Their toile looks like something a chef would wear. Coco Chanel’s original idea of a “cardigan-jacket” was that it would be comfortable as well as smart. She wore her jacket in many versions, and looking at photographs, it is clear that she was someone who was very stylish, with an absolutely obsessional attitude to impeccable fit. Look at how nicely set in her sleeve is. The Vogue patterns look a bit like they are made of cardboard – cardboard boxy. This jacket is supposed to be flexible, lithe, supple. That is why is is made without interfacing, with applied pockets. In my opinion this pattern is simply not flattering and needs considerable shaping and fitting before it does justice to the woman inside. Once I had a clear idea about how the pattern would make up I reshaped it, going down to the size 6 (purportedly for a 31 inch bust) across the upper chest and waist line (for a 23″ waist, supposedly), cutting out s8 sleeves, while retaining the s12 cutting lines at the hips, and between 10 and 8 elsewhere. I also lengthened the jacket by 3 inches at the waist line, and did not take up the hem by the same amount. This means it is longer than the B on the packet. 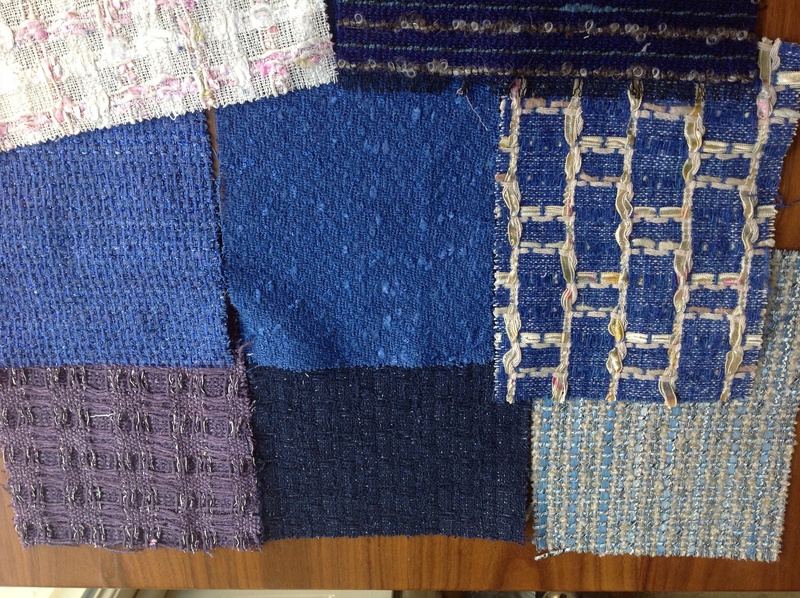 I bought a nice Linton tweed in light navy, with a fairly open basket weave and a silver thread (bottom, centre). For once I actually had enough fabric to make both a jacket and skirt. I made a really nice 60’s skirt from Vogue 6600. Both jacket and skirt are lined with an emerald habotai silk. I’ve long coveted a jacket like this, possibly ever since I first saw Jackie Kennedy wearing them. Timeless and classic style – job well done Kate. For Spring I’d be seduced by the very top left fabric (pink and white) and the bottom furthest right. A gorgeous suit, that suits you! I am sure you could make one Michala! The pink and navy one Jackie wore when JFK was shot has been preserved, still with the President’s blood stains. It seems Manuela bought the pink and white; I bought the bottom right beige and blue one and will blog about it soon. Wonderful little suit, well done indeed. Did you quilt the fasgiin fabric with the lining? It’s very time consuming, but I love how comfortable that makes those jackets. I do have a jacket length that white and pink Linton tweed on the upper left corner of your picture (I bought the black and pink version of it too last year) – thinking about fringes edges on that one…. I agree with you on the boxyness of those two patterns, but once you got the fit sorted, you’ve got a nice TNT pattern. I didn’t quilt the lining, but will do on the next one! Kate, if you’re happy with the fit you achieved with V 7975, there is no reason to go through all that again with V 8804, just for the 3-piece sleeve. If you are interested, I can email you a tutorial on how to draft a 3-piece sleeve from a 2-piece sleeve. That’s really kind, but I already bought the pattern Manuela! I had a look at it and in the pattern looks very similar to 7975 so I will just transfer my alternations. V 8804 is a bit different. There are no seams at the back and it has no side seams, it comes with a ‘side piece’ instead. I like it, because of the lack of seams at the back, it does make shaping it a bit tricky though.